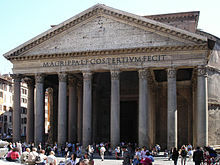 Hadrian's Pantheon in Rome is an example of Roman concrete construction. 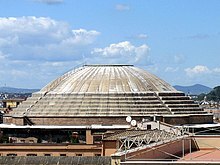 Outer view of the Roman Pantheon, still the largest (43.4m dia.) unreinforced solid concrete dome. A modern building: Boston City Hall (completed 1968) is constructed largely of concrete, both precast and poured in place. Concrete is an important material for making different buildings and structures. It is a composite made of Portland cement, sand, gravel or aggregate, and water in varying proportions depending on the task. Concrete is used more than any other man-made material in the world. As of 2006, about 7.5 billion cubic meters of concrete are made each year—more than one cubic meter for every person on Earth. The ingredients are mixed together into a paste, a bit like making dough for bread. The concrete is then poured into a frame. After a few hours it sets hard. Concrete solidifies due to a chemical reaction known as hydration. The water reacts with the cement, which bonds the other components together, eventually creating a strong stone-like material. Concrete is used to make pavements, pipe, architectural structures, foundations, motorways, bridges, multi-story parking, walls, footings for gates, fences and poles and even boats. Its biggest advantage is that it bonds together bricks and stones better than any other method known to mankind. Concrete is strong in compression but weak in tension. For some purposes it needs to be reinforced with steel rods. Reinforced concrete buildings can be made to link all the parts together, the foundations, walls, floors and roofs, but concrete construction does not make buildings earthquake-proof. Concrete is as old as 5600 BC. It was not invented by Romans, but much used by them. Some kinds of concrete are waterproof, and some kinds even set underwater. There are many additives to make concrete set faster, set slower, set stronger, reduce corrosion and so on. The Romans discovered that adding volcanic ash produced a concrete which would set under water. The Romans also knew that adding horse hair made concrete less liable to crack as it set, and that adding blood made it more frost-resistant. Modern concrete was made in 1756 by British engineer John Smeaton. He added pebbles and powdered brick to the cement. In 1824, English inventor Joseph Aspdin invented Portland cement, which has remained the main cement used in concrete production. He burnt ground-up limestone and clay together. The burning process changed the chemical properties of the materials and Aspdin created a stronger cement than plain crushed limestone alone could produce. The 19th century saw the invention of reinforced concrete by French gardener Joseph Monier in 1849 (patented in 1867). with improvements by François Coignet. This is concrete with steel bars in it, called rebars (reinforcing bars). Glass fibre or plastic fibre is beginning to replace steel bars. Many modern chemicals can be added to the mixture to achieve special objectives. 'Superplasticizers' are chemicals which improve workability, which means the ability to shape the concrete before it has set. Pigments can change the dull grey colour. Corrosion inhibitors can reduce rusting on the steel bars. 'Air entrainment' is blowing little bubbles in the concrete before it sets. This helps the concrete survive the freezing and thawing of a cold climate. Blast furnace slag can be mixed with concrete. It turns the colour into almost pure white and makes the concrete stronger. ↑ Lomborg, Bjørn (2001). The Skeptical Environmentalist: measuring the real state of the world. p. 138. ISBN 978-0-521-80447-9. ↑ "Minerals commodity summary – cement – 2007". United States Geographic Service. 1 June 2007. Retrieved 16 January 2008. ↑ 5.0 5.1 Bellis, Mary. "The history of concrete and cement". About.com. Retrieved 2011-01-25. Wikimedia Commons has media related to Concrete. This page was last changed on 12 March 2018, at 19:18.